Cinderella Castle is big. Really Big. Like, 198 feet big. It can be seen from a mile away. And in the designing of Walt Disney World, WED had to deal with this new kind of visual center point in the initial master planning process for the first time. Sure, The Matterhorn was (and still is, after 45 years of foliage growth) equally huge, but that was built four years after Disneyland’s opening and there was no good way to account for being able to see a future mountain from, say, Frontierland. So I guess this wasn't planned. The Magic Kingdom’s solution was to choose its’ battles. The front areas of the lands are among the most important for allowing guests to slip into the fantasy of being in another place and time, as well as screening out lands which do not have a complimentary appearance (for example, seeing Space Mountain from Adventureland). This was achieved through actually not using forced perspective in the areas nearest the hub: buildings like The Adventureland Veranda and The Heritage House are, in fact, nearly 100% scale and restrict your view of the castle by hugging pedestrian space close to the buildings. Further along, subtle architectural embellishments seek to harmonize with the spires of the castle: Liberty Square’s flagpoles and pointed cupolas, Tomorrowland’s old entrance spikes pointed skyward. In Adventureland is a rather odd spire near the exit of the treehouse. This author had wondered about its’ significance for years and years. Invisible from Liberty Square and all angles save one, it serves no purpose. Yet find the right angle, and the most subtle and brilliant example of visual harmony you’ll find anywhere suddenly becomes clear. ADDENDUM 4/19: For more on what I scribbled below be sure to read some the great, challenging responses to this one. For what it's worth I've also responded with my own usual critical blatherings and assorted nonsense. On July 17, 1955 Walt Disney dedicated Disneyland, rolled the dice one last time, and got for his efforts a huge nightmare of an opening day and a creative renaissance ever since. The public got that eternally vibrant image of a castle at the end of every major American street, and Southern California got a new culture center. What Disneyland was, was really a whole new kind of entertainment. Although the amusement parks of yesterday were indeed antecedents to Walt's dream of Disneyland, to say that the two are related by way of lineage is rather similar to saying that turning on a motion picture camera and making Casablanca is essentially the same act. Disneyland was such a colossal reinvention of what made an amusement park an amusement park that we must today remember that Disneyland built from scratch a totally new visual and intellectual vocabulary on which all subsequent three-dimensional entertainment venues would be judged. In 1955 Disneyland was not a theme park. It was a Disneyland, and although it was known that it wasn't an amusement park, kiddie park, carnival, or state fair, nobody was so certain exactly what it was. The words "theme" and "park" had not yet been married. Disneyland totally changed the board, and as such we must then evaluate it carefully in regard for what exactly it is. Although now the cultural terminology has equipped us to label it a "theme park", it is most importantly that major work which establishes a genre which Walter Benjamin has famously spoken of. We can, at least, safely say that it is some form of entertainment. Yet in the years since its' inception the public has grown to expect from the words "theme park" not the pre-Disneyland Fairs, Carnivals or even the glorious Coney Island, but increasingly the post-Disneyland hack jobs like Six Flags. In this regard, it can be safely assumed that Disneyland is not only entertainment, but a different kind of entertainment than can be found easily and elsewhere. As the finest example of what it itself initiated, is it, to again notate Benjamin, not just the major work which establishes or abolishes the genre, but the perfect work which does both? Or, to put it another way: is it art? Can great entertainment be art? This is the question which one must inevitably raise when speaking about any Disney product, as well as that of the many Hollywood moguls of the era. Like Disney, people like Jack L. Warner, Hal B. Wallis, Darryl F. Zanuck and David O. Selznick made great entertainment which was also, sometimes, great art. Like Disney, these men were not artists or businessmen but guaranteeors of quality and completion; like Disney, their personal touches are usually so ingrained into their product that it is usually easier to identify the trace of the producer than that of the actual filmmakers. Can entertaining films be great art? They can be. It would be remiss of me to say that Zanuck's Grapes of Wrath or Selznick's Rebecca or Warner's I Am A Fugitive From A Chain Gang are not great, great, American works of art. It's also silly to say that Disney's Pinocchio or Lady & the Tramp aren't also great art. But therein lies the rub, for one of the primary methods of evaluating art is to identify the authors, a process which the studio system (for example, the Disney studio system which produced both good and bad art, films, and theme parks) effectively cripples. But just as it is impossible to have Zanuck's Grapes of Wrath without John Ford, remarkably enough in the theme parks enough identifying fingerprints remain to make the true sources of authorship discernible to the educated eye, and once one begins to learn to recognize the colors of Mary Blair, the dynamism of Rolly Crump, the stark spatiality of Claude Coates, the lush textures of Herb Ryman and the earthy intensity of Joe Rhode one can't help but start seeing them everywhere. There is, in effect, no more nor less authorship in Disneyland than in any other entertainment venture of the era. So: is Disneyland art? And I respond: it can be. So let us forever set aside the silly argument that entertainment items must, in order to be entertaining, by definition not be artistic, a division which continues to retard discourse between those who favor only entertainment or art. Disneyland is both, and lacks none of the qualities or modes or art which makes it meaningful, nor fun which makes it relevant. The reason why it is so difficult to "read" the modes of discourse which Disneyland engages is is because there is no universally agreed way to decode these symbols, which often change from area to area and park to park. Indeed, attempting to read Disneyland as a cohesive meta-argument for anything is an ultimatley trivial pursuit, yet that is what makes the park evergreen in the eyes of the public. Disneyland is all things to all people, arguably its' reason for success and longevity, and it switches easily from a linear narrative space like Main Street to an abstraction like Tomorrowland. Yet it never loses power, meaning or intent, and as such it must be regarded as one of the most important and unique works of art of the 20th Century. The devices Disneyland uses to paint a narrative are subtle and varied. Space, in particular, is deployed to create meanings and association which are paradoxically filmic. You will find no plain square rooms at Disneyland. Spaces you are meant to walk down funnel, with the entrance at the widest end and exit at the smallest. The spectator is drawn down the space almost subconsciously in an invariably straight line. Spaces which are meant to entice curve out of sight, so that the act of transversing the space is a totally artificially created act of discovery. Compare the enticing infinite of New Orleans Square to the menacing infinite of the Haunted Mansion's endless hallway. Straight lines offer destinations; curves offer an unknown both appealing and uncanny. Disneyland's other major mode is that of signifiers, which generally fall into the categories of being either signifiers of danger, reassurance or exploration. Later Disney parks would add a number of new signifiers, but Disneyland still operates mostly on these three. The blinking lights and bright colors of Main Street reassure, Monstro's open mouth or the bends of the Jungle Cruise river offer danger, and the TWA Rocket or the Riverboat (both white) offer exploration. These are crude symbols, but they still work more often than not. And that, finally, really, is Disneyland's greatest asset and curse: as the first of its' kind, it is eternally a product of an art which had not yet reached maturity. The spirit of exploration and of a certain naivety - the spirit of it's times - is sealed right into the mortar which makes up its' foundation. Later Disney parks are larger, slicker, but more hollow. It may be that Walt Disney, that least pretentious of the art factory managers, still walks Main Street at night to keep the irony in check. While we all float in a sea of irony, Disneyland is eternally unironic, unhip, unsure of itself, reassuringly great entertainment and great art together. Disneyland is that lamp in the firehouse window when the rest of America's Main Street has gone dark, and we have not yet exhausted all that we can learn from it. I think that qualifies it as great art. So tonight keep a light on in a window for Walt Disney and Disneyland and the birth of a new kind of art, 52 years young. I had no intention of writing a piece on Disneyland for its' 52nd anniversary this week, but watching several old episodes of Disneyland and seeing Walt's enthusiasm for his playground and reflecting on the pure joy I feel in that place, I felt as though I ought to finally address that question I so often float around on this blog. I've tried to do it before and will probably try again, and as this piece really doesn't offer what I regard as any new insight I apologize for its' content. But it is intended as a preface to all that I'm attempting to do, minus perhaps the last fifty words, so please take it in that context as well as a reflection on why Disneyland will probably never be outdone in a certain sense. I know that anybody who's been reading this blog for any period of time may be shocked by this piece given my insistence on the artistry of the Florida property parks, which I think are still horrendously neglected and underestimated, but respect is due. At this point I've been posting these long essays for over a month now (starting with Waterways) so I've going to take some time off from pontificating and offer less cerebral insights until I actually have some material again. And remember, folks, if you have an additional opinion or insight, please share it with me. Rome wasn't built in a day and I too often feel like I'm battering into a brick wall here. My criticism is bound by my own prejudices and preferences in art and culture and I love to be proved wrong. If, then, we can advance the argument that Disneyland is essentially a number of components brought together to elucidate the theme of the American experience, and that this is the intent of the park as expressed through design, theme, and format, we must then regard Walt Disney’s cornerstone effort towards expressing his patriotism as the cornerstone of this theme. And thus began the 1964 World’s Fair version of Great Moments with Mr. Lincoln, which the head of the event thought the best thing there outside of the Pieta. It is also a key moment in the history of the development of the amusement park into the theme park into something resembling an art, for moreso than the capacity concerns which “It’s A Small World” addressed and fashioned a viable solution for, Mr. Lincoln finally cracked that old nut Mr. Disney had been trying so hard to break since 1955: the representation of reality. Back in 1937 the Disney animators proved that audiences would care about a drawing on a screen, and a brief review of Walt Disney’s ambitions for Disneyland prove that he probably and immediately wanted to prove that spectatorship could react in a similarly complex way to his new creative medium. After all, an animated film is no more or less synthetic than a fiberglass elephant. Or a President, for that matter. And it was Disney who was proved right and you can’t find anybody who wasn’t at the 1964 World’s Fair who doesn’t recall Lincoln and that almost the entire audience would cry. If that didn’t happen, they’d throw ball bearings trying to get the President to flinch. Here was the equivalent of that final scene of Snow White and make no mistake, just as Snow White finally and forever announced that animation could be great art, Mr. Lincoln was the start of WED’s greatest age. 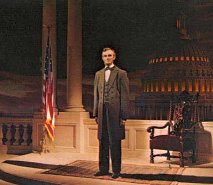 There has always been and will probably always be an inherent uneasiness among audiences regarding the merits of the audio-animatronics illusion, an uneasiness which the attraction itself partially, tacitly defuses by announcing that Lincoln was created of “the skills of the sculptor and the talents of the artist”. But even today, after living with the technology for nearly 45 years, audience members still find that Lincoln travels well into what we now know as “the uncanny valley” at the Walt Disney World Hall of Presidents, and therein lies the potential for great opposition. Richard Schickel, for one, saved a lot of venom for Mr. Lincoln in particular at the end of the otherwise positive “The Disney Version”, potently notating the Frankenstein myth as a valid pararrel. Disney films and Disneyland do not do any favors in painting Disney himself as an insufferable control freak, and in recreating a false human being, long dead, who is essentially impossible to distinguish from a real human being is, in the harshest criticism, essentially an affront to divine providence. In Disneyland, where the smallest details are worked out to the most minute extent, a place which Disney itself called a kingdom and the outside world is blocked out by a 15 foot berm, starting to install and display artificial humans for the amusement of the real humans is nearly asking for somebody to come along and hurl all this evidence of sinister intent right back at King Walt. But all this assumes malevolent intentions, and those people who most commonly need to assign malevolent intentions to Walt Disney’s personal projects are those who most commonly see little that is good in them. As a work of a kind of art created by a task force of artists under the personal supervision of Disney, Great Moments with Mr. Lincoln unpretentiously aspires to what pretentious works of art often fail to do: to inspire. The cultural exploitation of the figure of Abraham Lincoln in the program is in some ways the biggest cultural “cheat”: through the repetitions of the nickname “Honest Abe” and his constant appearances as a signifier of honest and unpretentious patriotism and common sense, Lincoln is one of America’s most overinflated balloons and as a result is one of most prized targets for those wishing to “make a statement”. Great Moments With Mr. Lincoln’s original Royal Dano recordings are today disquietingly slanted towards a McCarthy-era sermon on respect for America and Americaness, if one wishes to find political targets there. 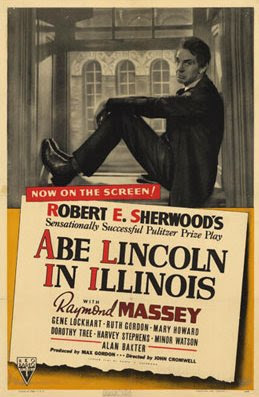 Our modern conception of Lincoln today comes from the play “Abraham Lincoln in Illinois”, which won the Pulitzer Prize and has received a number of filmed versions. It was here where Lincoln was most successfully and famously portrayed as a folksy, homespun hero who, by dint of his humble and uneducated nature as well as inherent brilliance, managed to portray everything Americans valorize about themselves in one fell swoop. As a result this play must have been in the mind of Disney, a self confessed Lincoln buff, and its’ influential fingerprints can be found all over Dano’s preshow oration of Lincoln’s early life in his own words. Another influence which bears close analysis which would’ve been in Disney’s mind at the time is John Ford’s 1939 film “Young Mr. Lincoln” starring Henry Fonda, and that role, along with his Tom Joad in Ford’s “Grapes of Wrath” are the two roles most closely associated with Fonda until his role in “12 Angry Men” many years later. Although coincidence cannot be discounted due to the somewhat inverse effects of the actual show sequences, the very end of “Young Mr. Lincoln” is rather similar in individual elements to the very end of “Great Moments” and “Hall of Presidents”. In the film, Lincoln, having just won an impossible to win court case, is asked “what are you going to do now?” to which he replies “I’ll just keep on going – maybe to the top of that hill.” He climbs the hill as a thunderstorm begins to rage, The Battle Hymn of the Republic creeps out of the storm, and the Lincoln Monument appears. This is not too far off, in general strategy, of a sunrise behind the Capitol building becoming an American flag to the tune of “Battle Hymn”, in that both feature a common song, deployment of a national monument strongly tied to democracy, and a symbolic weather transformation. 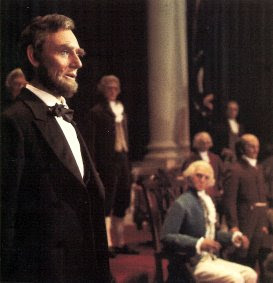 The Hall of Presidents show of 1971 greatly expanded the scope of the existing Lincoln show, adding every other President and a stirring introductory film. Here, Lincoln’s words, spoken not as a triumphant cry but a plaintive whisper by Royal Dano, are most stirring and effective. It really is a shame that this great performance cannot be heard in any medium today, with the 1993 removal of the original version of the Hall of Presidents show and the 2001 reworking of the Lincoln show into the clumsy and irrelevant More Great Moments With Mr, Lincoln, for the quotations that show director James Algar originally assembled seem more, not less, relevant today. Since no complete public record of Disney’s original “One Nation Under God” show exists we have no full idea exactly what Disney was planning in 1959 for his Liberty Street, but as in all of Phase One Walt Disney World construction, a semblance of his spirit was carried over through allowing all of the original key creative teams to revise their own work to a higher standard. In this light it’s hard not to think of The Hall of Presidents as anything other than Walt Disney’s final statement on America and Americaness, regardless of its’ approximation of his 1959 plans. And the original show – the version minus the current President speech and the dumbed down narration and intentional historical inaccuracies – is still a vibrant and stirring statement on the nature of the American Dream. It may be an invariably positive account of a country with an often over-idealized national history, but it never talked down to the audience and did so with no hint of superiority and irony. It is, in short, a show of as high a standard as Walt Disney would have held it to. The role of these shows in Disney history is often made light of, but Mr. Lincoln was as key of a moment in Disney history as any and deserves serious contemplation as such. As a microcosm of Disneyland’s theme as a whole, as a statement on Americaness by somebody who embodies what we think of as being American more than almost anybody (except George Washington, Ben Franklin and Abraham Lincoln themselves), and as the lynchpin of an 18 year Renaissance of Walt Disney’s own invented art, Mr. Disney’s Mr. Lincoln is arguably his greatest creation of all. This second part would not have been possible without the tireless efforts of Eric Paddon to document and comment on the various incarnations of the Lincoln shows as posted on www.nywf64.com, Widen Your World and Walt Dated World, as well as Mike Lee and Alison for hosting these efforts, and Bill Young of nywf64.com for pulling together a number of sources to aid this poor young fool in understanding exactly what the original Lincoln show was. When coherent analysis of any subject is to be attempted – that is, a subject which has meanings and modes and concepts and authors i.e. any work which can be reasonably classified as “art” – one of the first characteristics which must be established is intent. A statement of intent can be concrete or oblique, inferred, expounded, suggested, or insinuated. Intent is one of the key concepts for artistic appraisal, for without understanding intent, one cannot hope to understand content – this is why most American schoolchildren are taught the rather poisonous concept of the five paragraph essay with required thesis statement. Although such structures are indeed the antithesis (there’s that word again) of intelligent writing, the thesis is indeed a useful barometer for intent, as no words are minced and no ink spilled. It is then useful for this author and this subject that Disneyland comes with a sort of built in thesis statement. Its’ few words will be well known to any Disney fan, but they bear reprinting here so that the all-too-familiarized may reread them and really contemplate what they mean. Here is a thesis statement, of sorts, one so famous it has been committed to bronze and placed at the foot of none other than the American flag itself. As a microcosm of what Disneyland is, the arrangement cannot be accused of being incorrect. But the statement itself can be troubling, after all, are there not, here, two real statements of intent? It is around these two poles that many of the Disney parks orbit: a wish to entertain and enlighten on one hand, and a wish to document on the other. The wish to entertain usually resolves itself into attractions, the urge to document usually becomes the architecture, planting, and otherwise general setting. But let’s not mince words here and, for the moment at least, we’ll take Walt on his word: Disneyland is America. This is a dicey proposition. On one hand it’s not hard to see the connections: Main Street, Frontierland, and Tomorowland – three of the original five – all reflect aspects of American history both dear to Disney himself as well as commercially lucrative at the time. If we are permitted to extend the essay metaphor out of Disney’s 1955 dedication and into the park itself, it can be said that each “land” is a supporting “paragraph” in the “essay” which is Disneyland. This works even if we extend the reach of our inquiry to the only other land Disney supervised, New Orleans Square. So, then, is Disneyland less Waltland and more Americaland? Did Disney really beat coattail-competition Freedomland to the punch so definitively? Main Street, as the entrance to the park, is doubly significant as a signifier of America and as a signifier of Walt Disney. Although we can definitively say that the version ultimately built bears less of a resemblance to Disney’s turn of the century hometown and more resembles the set for a Disney produced comedy like Summer Magic, it is important in that it is a direct statement from Walt to the spectator: welcome home. In the first land of the new park, America has put its’ best foot forward and Main Street is less the crossroads of an era than the mainline to Walt Disney’s heart. It’s no wonder that he got away with letting his memory of the past lead directly to a fantasy castle. Frontierland and Tomorrowland, as both the far past and far future of America, are correctly oriented east-west on either side of this castle, and here a larger pattern reveals itself. 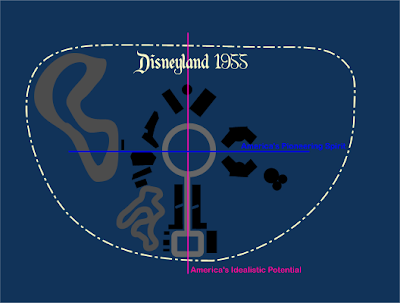 In the Disneyland television show Disney referred to the four “lands” as being similar to the four Cardinal points on a compass, and if we look at Disneyland, we see that the claim holds. Frontierland and Tomorrowland are placed at East and West (West, of course, for Fronteirland), and their alignment along an even latitude betrays their continuity as a record of America’s cultural conquest, first of the Manifest Destity of the west, then science and on to space. Traveling in a easterly direction from the 1955 Riverboat landing to the Flight to the Moon, one witnesses Americans conquering nature, building civilizations, the civilizations flourishing, expanding, advancing, until finally Americans conquer space itself. This narrative was not accidental. What, then, of North-South? Perhaps this longitude is of America’s idealism rather than its’ aggressive expansion. The park begins in the spiritual hometown of not only Walt Disney, but all Americans. There is even a shrine to Abraham Lincoln and it is not unusual to hear George M. Cohan’s “Yankee Doodle Boy” played over the public address system. Where does this idealism lead? Through a fairytale castle and to where all dreams come true. That these dreams are all Disney movies is perhaps a convenient but tacitly, partially true irony on the part of the design team. Then, it can be said that these “four cardinal points” represent America’s physical expansion in a east-west direction and America’s cultural optimism in a north-south direction: in short, much of America that is idealized and valorized by itself. They cross in the center at the revolutionary hub design, and remember, as originally planned the lands did not flow into each other but were self contained dead-ends. But even this design feature did not last long, and the only 1955 land not permitted a space on a cardinal access point was Adventureland, a true anormality for a park so perfectly emotionally and intellectually designed. But there it is and it is here, dear reader, that the author must admit that she is stumped because there’s no good way to chalk up Adventureland as anything but an exotic retreat. It is, at least, grouped with Frontierland, as both embody a bold sense of adventure and conquest of an untamed wilderness, but outside of chalking the area up as an embodiment of American inquisitiveness it’s pretty hard to pass it off as relevant to Walt’s “thesis”. It was even forgotten on the Dateline: Disneyland opening television special, and Walt Disney and Art Linkletter had to appear to awkwardly improvise a “haven’t-we-forgotten-something?” act. And so Adventureland is the physical embodiment of the flipside of the argument, where Disney’s claim, the park’s thesis-dedication, is an extension of his politics and that of the period. In a time when we were revising pledges to the flag and naming names and generally trying to be as Not-Russian-But-American as possible, Disney’s claim of Disneyland as somehow being a kind of permanent installment on the ingenuity and national character of America comes off as patently absurd opportunism. After all, he saw no need to stick to this thesis statement once it was out of his mouth, and for every attraction which is a genuine refection of American progress (The Submarine Voyage thru Liquid Space), we have half a dozen which are pretty inexplicable by the same criteria (Matterhorn Bobsleds). And this is the trap which Disneyland’s dual thesis statement, and that of all Disney parks, represents: the earnest desire to entertain and the sometimes-desire to document and reflect. So even if we can infer, for example, that New Orleans Square - Disney’s version of “The Paris of the West” - was meant to represent with its’ high end eateries and shops all that is culturally advanced about home-grown Americana, it still doesn’t quite explain why Walt built a Swiss mountain right in the middle of his ode to American ingenuity, Tomorrowland. So where, then, can we find the key to Walt Disney’s America in Disneyland? The park itself, not in its’ components, but in it, itself. The preshow to Walt Disney World’s reworked Carousel of Progress advances the claim that Walt Disney was about as American as anyone ever was, and the statement would be outrageous if it wasn’t pretty hard to refute. And Walt Disney’s America – Disneyland – is well organized, neat, freshly painted. It is clean, people are friendly, and there’s always a great big beautiful tomorrow shining at the end of every day. More than Davy Crockett or flights to the moon or Abraham Lincoln or omnibuses that’s what Walt Disney was telling America about itself with Disneyland.